When Fay Hill was a young girl growing up in Kingston, Jamaica, her father often brought her along to the community meetings he loved to attend. He always worked hard alongside his neighbors to make life better for everyone, and saw no reason why his daughter shouldn’t come along for the ride. Community involvement was just a part of Hill’s upbringing – it’s how life was. No surprise that she, now a retired legal secretary in Queens, NY, grew up to carry on the tradition. What an understatement! Hill is an active member of her local Community Board 13, a mover and a shaker in various church organizations, and a singer extraordinaire and tour-booking agent for the Senior Theater Actors Repertory (STAR). She’s a friend of her local library, and regularly travels to Albany for AARP meetings. She shows no signs of slowing down, and even recently joined Toastmasters to hone her public speaking skills! What does it take to revitalize a forgotten park? Near and dear to Hill’s heart these last four years is the revitalization work taking place at Springfield Park, just a few blocks from her home. It’s a public space that almost fell through the cracks, but is making a big comeback, thanks to the efforts of volunteers like Hill, as well local officials and non-profit organization Partnerships for Parks. 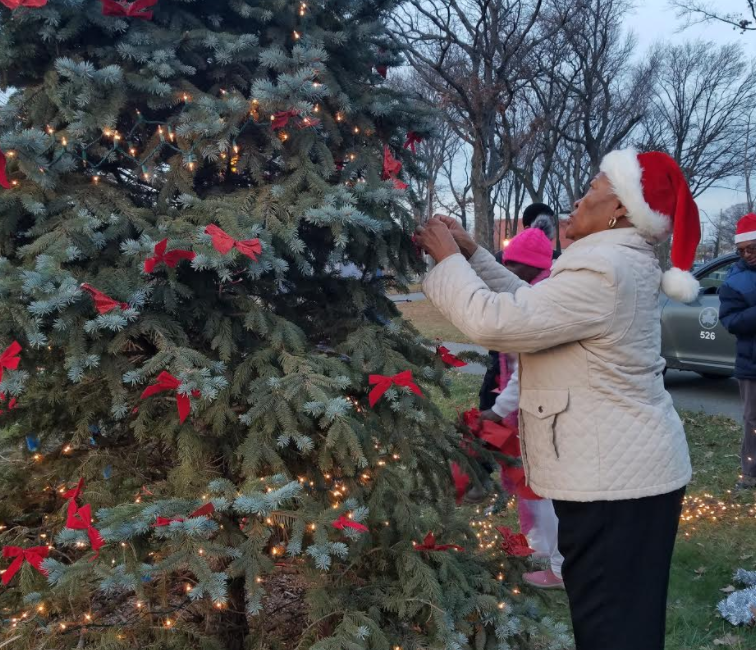 Rarely has that transformation shone more brightly than it did just last week, at the 4th annual Springfield Park Christmas Tree Lighting. 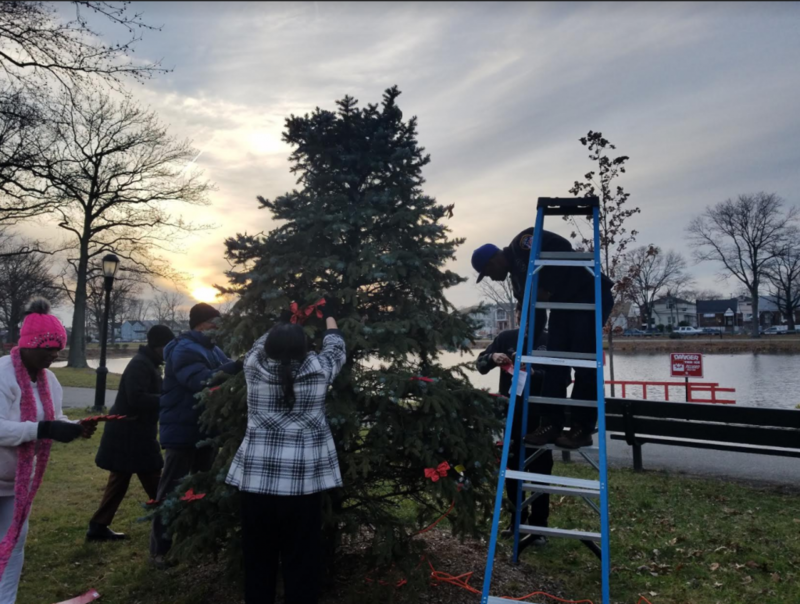 The Christmas trees planted in the park in 2013 and 2014 had both died, and then the lights had been stolen right off of the tree in 2015, but Hill wasn’t fazed. Progress isn’t always linear, and it isn’t always speedy. So she moved right on ahead, working with park management this year to get the hardiest tree possible, taking a special trip to the store to stock up on lights and decorations (once they found out what the decorations were for, everyone at the store wanted to help Hill find what she needed), working with her teammates to make up fliers, and dropping them off at local grocery stores, shelters, and libraries. 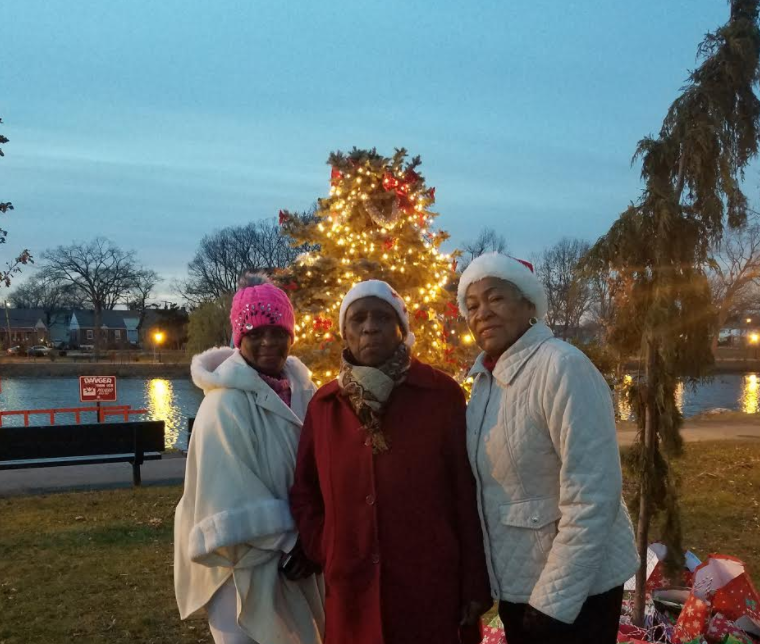 The event was an overwhelming success; the beautiful Christmas tree’s lights came on at dusk, and then there was singing and merrymaking. Hill and her team had been able to raise enough money to give a gift basket to every child who showed up in the cold: scarves, earmuffs, socks, coats, PJs, book bags, candy canes. Neighbors left smiling and called Hill to thank her in the days after. “This year was better because of the fundraising,” Hill explains. “At the last minute, ioby kind of pushed me for the last two days of the campaign. I hate to solicit, and I didn’t know I had this in me, but I was able to raise most of the money in the last two days. And most of the people to be honest, they didn’t want to go online to make donations, so they decided to give me a check or cash. One person gave me five dollars and joking around said don’t let me get the IRS on you!” It was an awakening for Hill, veteran activist and crowdfunding newbie. She knows now that it’s okay to ask, and that her neighbors want to give. She’s got one more neighborhood-building tool in her toolbox, and we can’t wait to see how she’ll use it just around the corner, in 2017. Feeling inspired? Want to take action in YOUR neighborhood? If you have awesome ideas about how to make your town greener, safer, and more fun, let us help! Tell us your awesome idea right here. We’d love to help you get started today. Check out 2016 in video, numbers, and ioby Leaders’ own words here: ioby.org/2016.